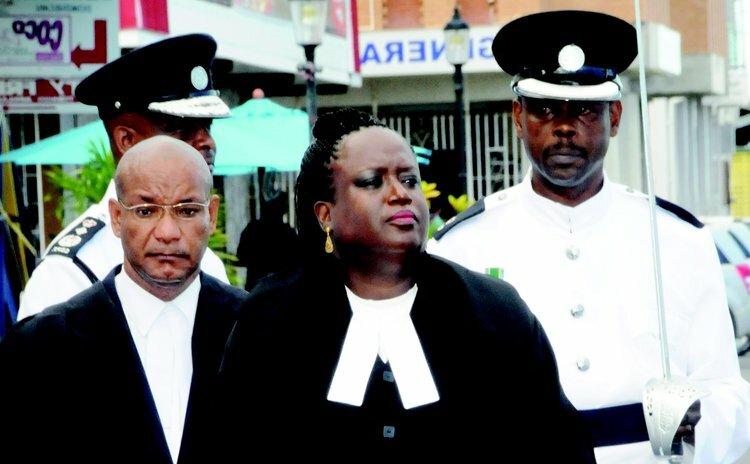 The virtual complainant in the shooting incident at Castle Comfort in October 2009 took the witness stand at the Roseau High Court presided over by Justice Birnie Stephenson before a jury of four men and five women when the trial of Linden Lestrade of Canefield continued on Monday March 31 after a two-week break. Greg Joseph, the eighth of the 15 witnesses of the State would spend three days on the witness stand, two of which was for cross examination by defence lawyers Zena Dyer, Michael 'Mikey' Bruney and Gina Munro. Lestrade is being tried on the charge of unlawfully and maliciously shooting Greg Joseph of Roseau with intent to do grievous bodily harm at Castle Comfort on Saturday October 3, 2009. Joseph told the court that he had a telephone conversation with a work colleague, Jamilla Joseph, about 1:30am that Saturday. He drove to Bath Estate to pick her up. They drove off to Krazy Kokonuts (KK), a night club, at Castle Comfort. "I parked my vehicle by the McMillan Service Station. Jamilla made a phone call to Naja. We proceeded to purchase tickets and we entered," he said. Naja introduced Greg and Jamilla to her friend Ian Bowers. Greg and Jamilla went to the bar where he bought one Monster drink for Jamilla and one Red Bull drink for himself. Then they started dancing. Greg said he saw Hardley Joseph, a former boyfriend of Jamilla, approaching them. Hardley Joseph said something and slapped Jamilla Joseph on her face. "I looked at him angrily, and Jamilla told me something. Hardley then walked away. Jamilla was crying," he said. A crowd gathered, a police officer dressed in camouflage came and asked what was wrong. "We told him and pointed in the direction of Hardley Joseph. Shortly after, Mr Lestrade came. He asked what was happening. Jamilla responded to what he asked… and we walked towards the exit of the dance floor, and he (Lestrade) left because he could see Hardley in a tussle with police officers… I (also) saw Mr Lestrade and Hardley in a tussle. "Jamilla and I decided to leave. We left Krazy Kokonuts to go to my vehicle. While walking towards the vehicle I saw Hardley being placed outside. I saw Mr Lestrade with him. We continued towards the vehicle. They were about 45-50 feet away. Jamilla began running. Hardley passed me. He said something to me. He ran towards Jamilla and started slapping and choking her. They both fell to the ground. I tried to free Jamilla from Hardley by pulling on her legs. Ian Bowers came and tried to free Hardley from her by pulling Hardley's hands away from choking her'. Police Constable Naford Joseph was the officer who released Joseph into the care of the accused when Joseph was being put out of KK sometime after 3:30am. Acting Corporal of Police Urias Moses, Junior, was also on duty at the KK. About 4:00am that Saturday he saw a young man in the custody of Constables Naford Joseph and Delroy Julian. The young man was behaving very violently. He heard Julian tell the man to calm down in the presence of the accused. Moses walked towards his fellow officers and the young man who continued to behave aggressively. "The accused said to me, he is the drummer in our band, give him to me, I will take care of him. At that point I asked the young man for his name and address, and he said he was Hardley Joseph of Coulibistrie. I warned him and released him in the custody of the accused," he said. Moses returned to his duties but noticed that Hardley continued to behave aggressively, and heard the accused telling Hardley to behave himself. At that point I escorted Hardley Joseph and the accused to the gate and put them outside. Corporal Moses faced cross examination by Counsel Dyer as The SUN went to press. The trial is expected to end this week.